I know that I have a page on this website dedicated solely to cheese, but recently I experienced a cheese that was so incredible, possibly even life changing, that I had to dedicate an entire post to it. Before the holidays I was lucky enough to be invited to a class on Wisconsin cheese at the Cheese School of San Francisco, and the first selection that was served was one nobody had heard of: Rush Creek Reserve. 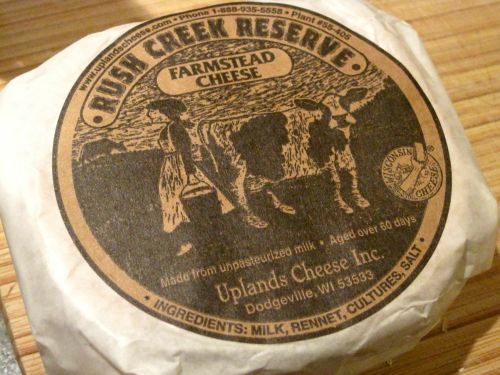 It's produced by the Uplands Cheese Company, the same makers who produce Pleasant Ridge Reserve, which has one best in show for 3 years at the ACS. The Rush Creek Reserve is brand new, the only other cheese being sold by this company, and in my opinion, 500 times better than the Pleasant Ridge. The consistency is very soft, so the way to eat it is to cut off the top and essentially scoop it out with a butter knife or spoon. Since it's so soft, you may want to put it on bread or a cracker, but I like eating it right off of the spoon. Hey, some people eat pints of ice cream as an indulgence, I like to eat spoonfuls of cheese. The taste is smokey and bacony, but not nutty or overly smoked like a smoked cheddar or gouda. It's very savory and, although it has a washed rind, there's no funk to it. And because it's a raw-milk cheese (aged the minimum allowed in the US, 60 days), there's no real sharpness - it's just smooth. Honestly, it's actually incredibly hard to describe because I really can't draw any comparisons to other cheeses I've tried before. And that's the thing - after years and years of being obsessed with cheese, it's truly incomparable. Bi-Rite has carried Rush Creek Reserve for the last 2 seasons (which only lasts a few months), and I'm not sure what other cheese shops are carrying it. It's not cheap - $30 for a round (and you should buy it whole) - and it comes in a very limited supply that sells quickly so you have to make sure you get there soon after the shipment arrives And you better get there before I do, cause next time I'm stocking up. Sooo... I ate at Gary Danko about two years ago and had the Pleasant Ridge reserve in the cheese course. I immediately became obsessed and ordered pounds from their website. I bet they'd sell you some Rush Creek if you called them and asked. Just the concept of a cheese 500 times better than Pleasant Ridge made my brain explode, so I can't talk about the cheese itself. I love your cheese list, my favorite is Manchego! I need to try the Rush Creek. Sounds delish!!! Manchego is delicious. You should try a tomme Brebis or Petit Basque - not exactly the same as Manchego cause they're not as sharp, but similar texture and so good! Thank you for letting me try this over the holidays truly delicious. I concur with the author - this is an amazing cheese, similar to Vacherin Mont D'Or but raw milk, and IMHO so much better than anything that's been imported to the U.S. in a similar vein. I contemplated bread but quickly changed my mind after trying a spoonful of the stuff - simply amazing. I don't know how much of this cheese we're going to see in the Bay Area, but I found it at the Woodlands Market in Kentfield. If you can get your hands on it and want to try a one-of-a-kind cheese, create a party centerpiece, or just compare this to Swiss (Forsterkase) and French (Vacherin/L'Edel de Cleron) imports, grab it while you can! Glad to hear from another rush creek reserve enthusiast! You're right that we may not see it in the Bay Area for much longer, it's made with milk from late-season milk which has higher fat content than at other times of the year. And it was just featured in the chronicle last week, so I'm guessing it'll be hard to get your hands on.